The Kid as he is known around these parts (he is the youngest one in the shop), has been on the summit county fishing scene since he first competed in the annual kids fishing tournament. He started working at the shop while still in high school. He told us he finished early but we suspect he just ditched the last semester to focus on his cast, and his fly tying. 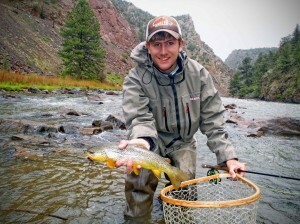 The Kid is a true Colorado Sportsman, he was born locally and lived locally his entire life. Whether chasing trout on the fly, hunting elk with his bow or being harassed by the sly fox while fishing the hard water, you won’t find a person more excited to spend time outside. While most of Colorado Anglers staff enjoys the winter sports that summit county has to offer the kid would rather talk about his fish finder, his new shanty, or just plain make stuff up about his most recent ice fishing trip. Though, there is truth to some of it, as we did recently see the proof in the form of a check he won at a recent ice fishing competition. Nick is our only “hard water” guide, and has been growing his winter clientele each season. Seriously though, any time spent with Nick, either on the water or in shop is truly great time. His calm demeanor, and patience is just what is needed while learning the art of fly fishing or chasing a big, Blue River tailwater fish. From the first moment you meet him it is obvious that he has the utmost respect for the place he grew up, the Rocky Mountains of Colorado.